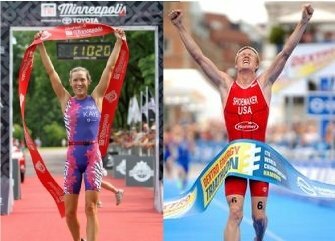 Professional athletes put in more hours training that just about any age grouper. Their bodies are under constant stress. To make a living by performing at their peak, it's is critical for them to keep even the smallest of niggles under control. Alicia Kaye and Jarrod Shoemaker have over 30 years of professional competition between them. That's a lot of hours in the saddle. To win like they do, everything has to feel right. Including the private areas. When other products didn't meet their high standards of effectiveness combined with all-natural ingredients, they set out to make their own. The result is by far the BEST chamois creme available anywhere: Endurance Shield High Performance Chamois Creme ! I've known Alicia and Jarrod now for almost 10 years and I'll testify that there are few people anywhere with more integrity and commitment to their sport. When I say commitment to their sport, that includes everyone who competes in it at every level. Their commitment with Endurance Shield is to provide you with the highest quality, most natural and most effective products possible; dismissing shortcuts and cost cutting, avoiding chemical additives altogether and diligently seeking out the finest quality ingredients. That's what makes Endurance Shield a product you can trust. Endurance Shield High Performance Chamois Creme is made for your most sensitive areas. Hours spent in the saddle can cause irritations or “saddle sores”. To prevent this, it’s important to always keep your undercarriage lubed, moisturized, and bacteria free with Endurance Shield High Performance Chamois Creme. Endurance Shield Chamois Creme blends Azulene, Echinacea, Calendula, and nature's own antibacterial agent, Tea Tree Oil. This soothing blend calms pain, encourages healing, and prevents friction. The ingredient list is short and packed full of ingredients from nature that you can feel good about putting on your most delicate areas. Try Endurance Shield Chamois Creme on dry, cracked, or chafed skin. It’s a great healing lotion! We even hear that baby bums find that it soothes even the toughest diaper rash. Regardless of where you put this super cream, it’ll shield you on your longest rides. Go baby go! 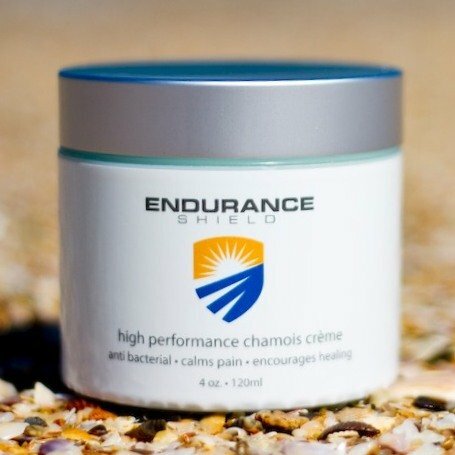 I'm really happy to be able to send a free 4oz canister of Endurance Shield High Performance Chamois Creme to every subscriber this month! That's a $25 value, FREE! Subscribe now because supplies are limited!! Every month subscribers get really cool stuff free! So every month I will include some really cool and helpful extra in your subscription package. FOR FREE.